Key cutting is a science. Without the proper equipment keys can work only part of the time or may not work at all, wasting your time and money. Vehicle Locksmith keeps up with the latest equipment technology in the art of key making. We can cut every type of car, truck, motorcycle, RV, home or business key. 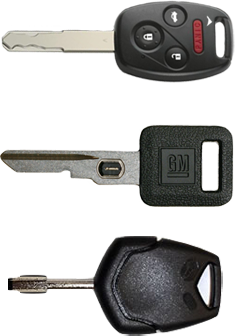 This includes laser cut automotive key, transponder keys, smart keys, vehicle anti-theft system (VATs) keys, valet keys and more. Because we cut your keys by code, they are sure to be accurate and working for you at all times. Laser cut keys which are also called internal cut to sidewinder keys have high security standards. Transponder keys are keys which have the transponder built into the key. Smart keys are strictly electronic in nature, and are considered a type of keyless entry system. Vat keys have a built in security system which the car verifies before the vehicle will start, if the key is wrong the car will not start and will go into a non-start mode for a specified period of time based on the car make and model.